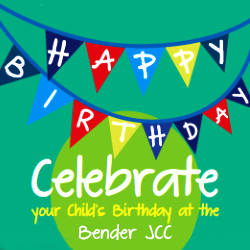 Celebrate in style at the Bender JCC of Greater Washington! Includes 15 guests (children), pizza and juice boxes, personalized cake, paper goods and party decorations. Includes everything in the Basic package plus balloons and goodie bags for all your guests!